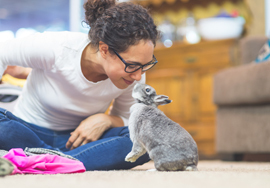 Taking your four-legged friend away with you adds a whole new dimension to family holidays. Whether you’re staying in the UK or holidaying abroad, travelling with your dog can be great fun – provided you’ve planned ahead! There’s nothing nicer than sharing your holiday with your dog or puppy. 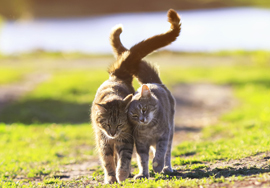 Here are our top tips for stress-free travelling with your pet. If you’re organising a vacation with your pet, it’s worth planning ahead. A quick Google search will find you plenty of dog-friendly hotels and accommodation, and it’s always a good idea to book early for the best choice of options. Most dogs need a rabies injection before travelling abroad – in fact, you won’t get a UK pet passport without proof that your dog is up to date with their vaccinations. Make an appointment with your local vet and get your pet protected. Speaking of UK pet passports, you can’t take your dog overseas without one! Your dog must be microchipped and have an up-to-date vaccination record to qualify for Defra’s Pet Travel Scheme (PETS). Click here for full details, and how to apply for a passport for your puppy or dog. Bringing your dog’s favourite comfort toy or blanket with you when you travel is a great way to ensure a stress-free trip. Keeping the familiar smell of home close by will help to keep him calm and relaxed on your journey. 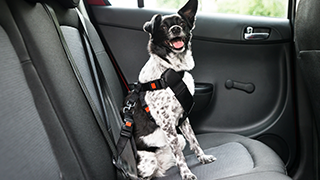 You wouldn’t start a long trip with a full stomach or bladder, so don’t expect your dog to either. While it’s a good idea for your adult pooch to fast for at least six hours before travel, always make sure your dog has access to enough water to stay hydrated throughout the journey. Puppies should not go without food, and small, easy to digest meals are the best option. 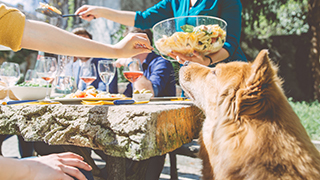 Make regular comfort stops that incorporate a small, healthy snack and the chance to stretch those legs – yours and your dog’s! And remember – never leave your dog in a parked car, especially on a hot day. Most airlines publish their own guidelines about travelling with pets, and rules vary depending on who you’re flying with. It’s a good idea to check out the website of your airline before you book, and reread before you travel. Follow their advice can help you have a stress-free flight with your dog. The best pet-friendly hotels offer a special welcome and facilities for dog owners and their pets. Most will recommend parks and open spaces for you to exercise your dog. While you won’t want to let your dog or puppy out of view, new sights, sounds and smells can prove too tempting for some pups. Always make sure their tag shows your current mobile phone number in case he or she does break away, so you can be reunited fast. We recommend taking a copy of your dog or puppy’s vaccination records and other documents with you when you travel, in case of emergency. You never know when you might need them – particularly if you’re holidaying outside the UK with your dog and can’t easily get copies from your local vet. If you’re travelling far from home it’s a good idea to bring your dog’s favourite food and treats with you. The familiarity of their favourite snack can help settle any nerves or anxiety caused by the journey, as well as avoiding the upset stomachs that can be caused by unfamiliar food. Similarly, if your dog is crate-trained, bringing this along on your travels will give your dog more of the sense of home, and you a little more control when needed. Your local vet will be happy to answer your questions about travelling abroad with your dog or puppy. To find your nearest recommended vet or pet clinic, use our Find a Vet page.